Mangaluru, July 15, 2016: DK DC Adoor B Ibrahim on July 14, Thursday said Dakshina Kannada has received 1642.5 mm (94%) rain from January to July 13, as against the expected 1750-mm rainfall for the same period. Addressing media at his office, DC Ibrahim said, "In the same month period last year, the district had received 1,412 mm of rainfall against annual average of 3,912.2 mm." Joint Director of Agriculture Department Kempegowda said, "Following the rain, sowing has been completed on 14,000 hectares of agricultural land. More number of farmers opting for mechanisation is yet another positive sign of increasing agricultural activities." 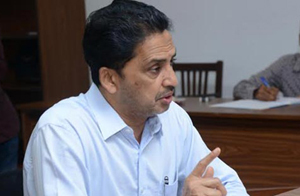 According to the available statistics, Bantwal taluk in the district witnessed destruction in large quantity, owing to heavy rain and gale on May 17 - following which, compensation of Rs 48 lakh has been distributed among the victims. Property worth Rs 185.11 lakh has been damaged and compensation of Rs 94.82 lakh has been distributed. The damages include 1,154 houses, estimated to be worth Rs 75.65 lakh, horticulture crops worth Rs 12 lakh, besides the death of a person in one case. Cattle were injured in four cases and injuries (human) were reported in two cases.